Patient age is shown as mean ± SEM (range). MRSA, methicillin-resistant Staphylococcus aureus; MSSA, methicillin-sensitive Staphylococcus aureus; MRSE, methicillin-resistant Staphylococcus epidermidis; MSSE, methicillin-sensitive Staphylococcus epidermidis. SAGN, Staphylococcus infection–associated GN; IgAN, IgA nephropathy. SAGN, Staphylococcus infection–associated GN; EM, electron microscopic examination. 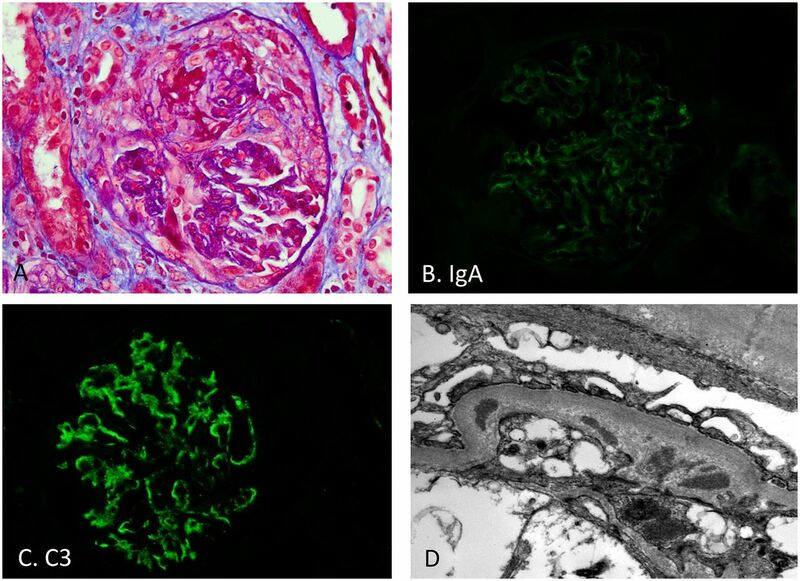 Incidental mild IgA deposits (often in chronic liver disease) Unremarkable glomeruli Mild IgA, no accompanying C3 No or few mesangial electron dense immune-type deposits.